A Tribute to Victoria Wood - Slapstick | Bristol's Silent Comedy Festival. Victoria Wood performing at the Silent Comedy Gala in January 2013, at Colston Hall. She saved the event when she stepped in last minute. Chris Daniels, Director of Slapstick Festival, has paid tribute to Victoria Wood – who saved an event when she stepped in last minute to replace a headline act. 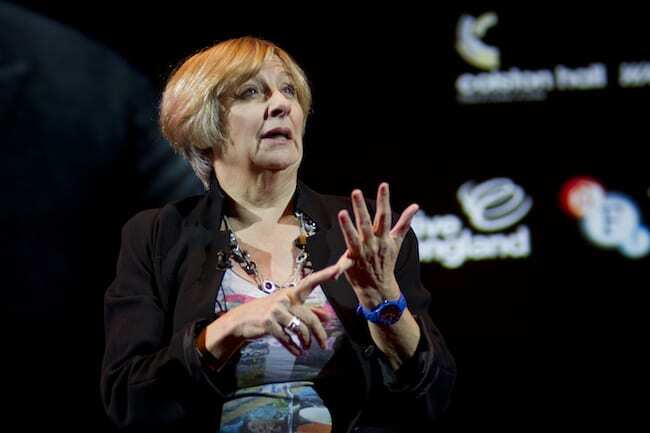 Victoria Wood, who died from cancer aged just 62 on April 20, hosted the Slapstick Gala in January 2013. She took over as The Gala’s master of ceremonies after Dara O’Briain had to pull out because of an unexpected clash with filming commitments in Africa for Comic Relief. Victoria Wood performing her Step Aerobics sketch. Graeme Garden, OBE, is a member of The Goodies and co-founder of Stand-Up for Slapstick. He was also a friend of Victoria Wood and worked with her on BBC Radio 4’s I’m Sorry I Haven’t a Clue. Back in 2013, he reached out to her just weeks before the event and she kindly agreed in an email, saying ‘Oh, go on then!’ Regardless of not having done stand up for years, the short notice and the travel to Bristol, she single-handedly saved the event. She introduced the Gala of three films taken from the silent era, with stand-up comedy in between. She returned in 2015 for a celebration of Gloria Swanson, an actress and producer best known for her role as Norma Desmond, a reclusive silent film star in the critically acclaimed 1950 film Sunset Boulevard. We are planning to host a show in Victoria Wood’s memory at the Slapstick Festival, which runs from January 19 to 22. The fundraiser, Stand Up For Slapstick, will take place on Sunday, June 12.